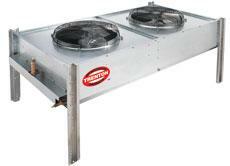 TRENTON TCS - Small Air Cooled Condensers | M. J. Mac Inc.
• Internally enhanced tube and fin design. • Energy efficient fan motors. • Available standard in the horizontal Airflow configuration. Easily convertible to vertical airflow configuration by mounting 4 optional mounting legs. • Optional factory mounted receiver kits available on vertical airflow models or shipped loose kits for horizontal airflow models, both with or without heater and insulation.